July 9th- 12th 2015 Historic Farm Days is back! This year John Deere and Chevrolet are the featured brands of tractors and trucks. This event is always a big one for us especially this year since the Half Century of Progress in Rantoul will occur in August right on the heels of Historic Days. After the 4th of July it seems that summer just flies and the events blend from one to glorious next one. The I & I Show has a lot of special things about it that make it special to us. First it is a place where we meet up with friends that we may not have seen for a while. Some we have got to know through stories I have written and others we have come to know over time. However we have met with the friends and collectors it is a show where every other golf cart is filled with someone special representing a very special tractor! This show is a reunion of sorts. If you visit Penfield make sure you take time to go into the museum which is located in the former Penfield grade school and see the great collection of farming artifacts and rare items inside ranging from hand tools to tractor drawn implements. 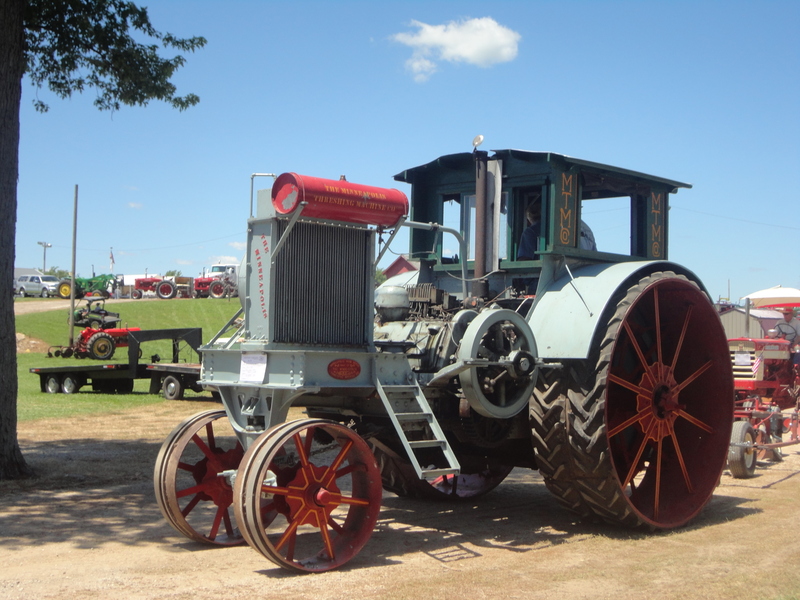 In the gym, larger machines are on display, including corn shellers, threshing machines, and of course the two tractors on loan from the Smithsonian, the world’s oldest running gas engine tractor, the 1903 Hart-Parr, and the futuristic 1961 International Harvester HT-341 Turbine Tractor. Drive through or ride on a people mover to see the field events sometimes I think collectors don’t realize that section is back there and it is great fun to see machinery in action. Several events are going on during the show like corn crib filling, a tractor parade, a sawmill and blacksmith demonstration and more. There is a building with quilts to take a look at and this building is air conditioned for those like me that can’t take the heat and sometimes need a cool oasis. The school where the museum is also offers the Chapter 10 e IH Collectors recreation of 1950’s era IHC parts counter, a gathering place for IH enthusiasts during the Historic Farm Days show in July each year. Dealership section and a women’s old time kitchen set up that showcases many of the latest home conveniences of the early twentieth century as well don’t miss anything the show has to offer. The remaining room is used for the Corn Items Collectors display during the summer show. Next year Graham Bradleys and the Sears related tractors are coming back to Penfield so if you enjoy these tractors like we do put the date on your calendar early on. Log on to http://www.antiquefarm.org/ShowSchedule.html for details.